In today’s restaurants, vegetables are no longer playing supporting roles; if they’re not headlining, they’re often taking big parts on the menu. You’re down with vegetables, too, knowing that eating them seasonally is good for your budget and your gut. But how do you get started? First, stop limiting them to side dishes and salads or typecasting (cucumbers can be more than pickles or eaten raw). Next, think about shape and method, both of which affect flavor and texture. Restaurants aren’t steaming cauliflower, they’re cutting the heads into fat slices and roasting or grilling them like steaks (in fact, they’re calling them steaks). After all, shaved asparagus doesn’t taste like whole spears, and roasted beets are sweeter than boiled ones. Thick rounds of zucchini operate differently than thin slices. Take note the next time a vegetable confronts you in an unfamiliar form. Ask your server how the dish is made. Dive in here for ideas, and go deeper with recently published cookbooks by chefs changing the narrative on plant matter. Once you adopt new methods of cutting, cooking and seasoning vegetables, they will naturally migrate to the center of your plate. Understand your ingredient. Keep in mind that vegetables, for the most part, cook quickly. Roasting, grilling and pan-searing create flavor. Roasting vegetables will concentrate their sugar content. Searing and grilling create caramelization, which equals flavor. We know it’s tempting, but avoid stirring or shaking the pan too soon. This prevents browning and prolongs cooking. Before you know it, your veggies are overcooked. They cook quickly, so your heat needs to be high. Forget about steaming or boiling, which drain flavor out of vegetables. The size and shape you impart on a vegetable impact flavor. Consider Brussels sprouts, which need little more than salt and pepper when roasted whole and tossed in butter or olive oil. But halving or slicing each one into three or four pieces and sauteing over high heat offers more complexity. The outer leaves that fall off each sprout are browner, even burnt, while the inner parts are nicely caramelized. Seasoning falls between the leaves, concentrating flavors. Some vegetables with thinner skin, such as fresh asparagus, can be served raw or sliced paper thin. Add a protein, such as leftover chicken, cooked shrimp or other vegetables, toss with lemon juice, fresh herbs and canna oil, and the meal is complete. Just be sure to slice other ingredients in uniform sizes. Also, consider shapes that resemble other dishes. Spaghetti squash, as its name suggests, looks like a tangle of noodles after it’s cooked and scraped with a fork, lending itself to similar presentations. 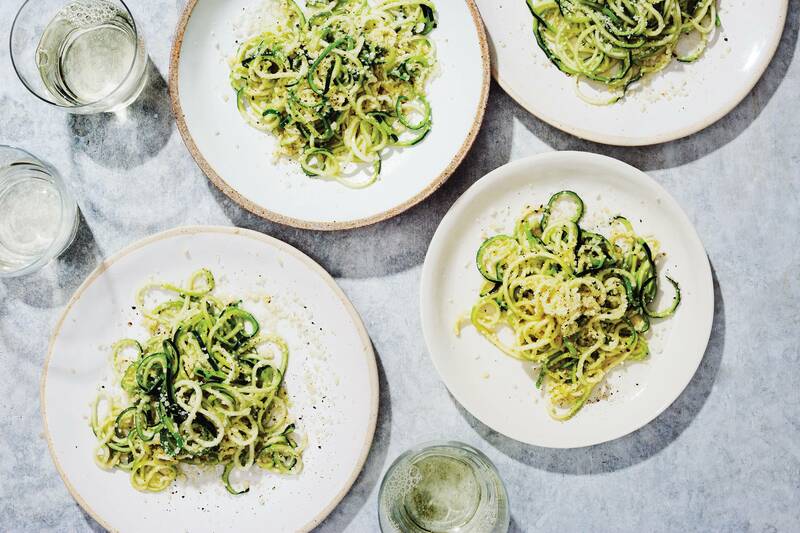 Other vegetables, such as zucchini, yellow squash or bell peppers, can be turned into ribbons and strands with a spiralizer. Because some vegetables, such as potatoes, act like canvases ready to take on flavor, cannabis has plenty of entry points. Canna oil can stand alone or join a dressing, drizzled before serving. Cannabutter can sub in for the fat for sauteing or roasting. Infuse it in cream for a sauce or whip it into a mayonnaise. It all depends on the dish. The point is, if you think about vegetables differently, they’ll return the love in a big and satisfying way. 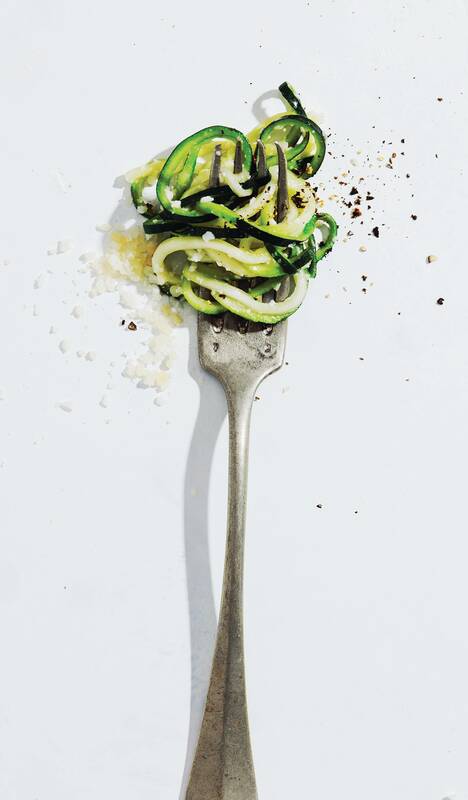 Get the Zucchini “Chitarra” Cacio de Pepper recipe here. For the Carrot Steaks, Feta, Greens and Almonds, tap here.